The Citrus Grove Quilt is a fun play on the Drunkard’s Path block. Although the shape is similar, and the curved piecing technique is the same, the Citrus Grove blocks are trimmed, pieced and combined in a unique way. 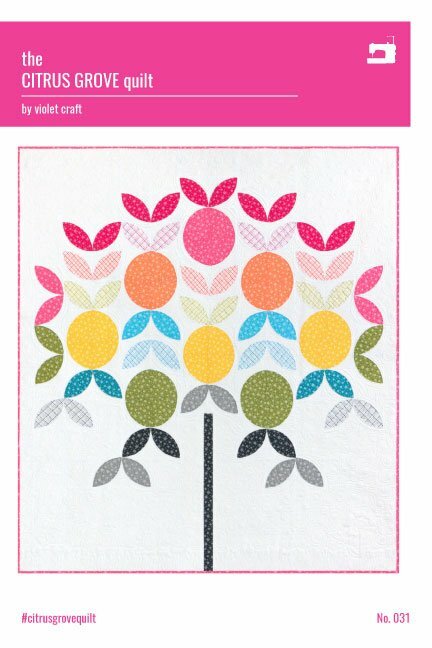 The Citrus Grove Quilt can be made in different sizes depending on the size of templates used to complete the quilt. Yardage requirements and full instructions are included for use with 3” or 5” finished Quarter Circle template patterns which are provided for transfer to template plastic. Before beginning this pattern, copy the template patterns on 8.5” x 11” paper and transfer to template plastic.